I want to make my dh a quilt. 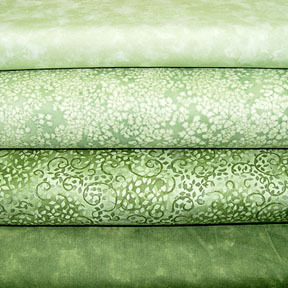 He likes green.....I am trying to find a jelly roll and yardage to purchase to make the quilt. I'm not having a whole lot of luck. I found a roll on Jelly Roll 2 Go, but they don't have any yardage. Try www.favoritefabrics.com - they have jelly rolls and yardage - you can look it up by color - so if you look for green fabrics - it will give you tons of choices - and they have great prices. 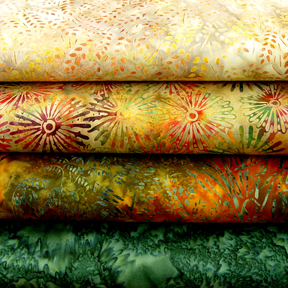 They are my "go to" source... love that you can order as little as 1/4 yard... very unusual for on online shop. Thank you, 0tis, and Lori, for mentioning my store! We make them in regular cottons, batiks, and even metallics. 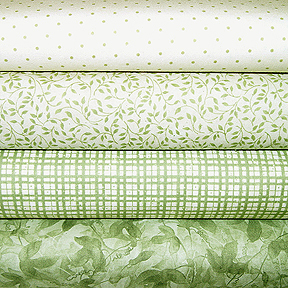 love the examples pictured -- I want to make a green and white quilt in the future -- now I know where to go!!! 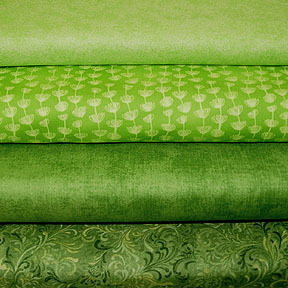 I don't need any green fabric right now, but I'll be checking Favorite Fabrics out when I do. Thanks for the sample photos. Sorry it has taken me so long to get back to the thread......those fabrics are BEAUTIFUL!! I will certainly check the links to see what I can find. I'm glad you like the fabrics, Ginger, thank you for looking! I agree... super yummy! So fresh looking!